Venice attraction-guides.com - Venice, Italy attractions guide Venice Ciesa Santa Maria, Church information about attractions, architecture, Grand Canal, lagoon, octagonal church, history, designed by Longhena, location and address, tel / telephone number, general tourist information about Santa Maria della Salute in Venice (Venezia) area, Italy (Italia) IT - Last updated 30/10/2012. The Ciesa di Santa Maria della Salute is a particularly famous landmark in Venice dominates the view of the Grand Canal from the lagoon, with sparkling water reflected on its bright surface. 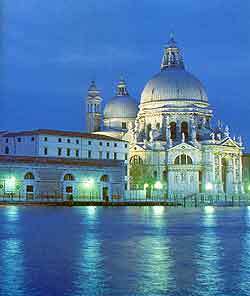 Venice's Ciesa di Santa Maria della Salute is a very individual and extremely attractive octagonal church, constructed partly of 'marmorino', a brick covered with fine marble dust. The Ciesa di Santa Maria della Salute was built between 1631 to 1681 after the city of Venice began recovering from the great plague of 1630 to 1631. Venice's Ciesa di Santa Maria della Salute was designed by Longhena and has an eye-catching white dome and very impressive baroque-style architecture.